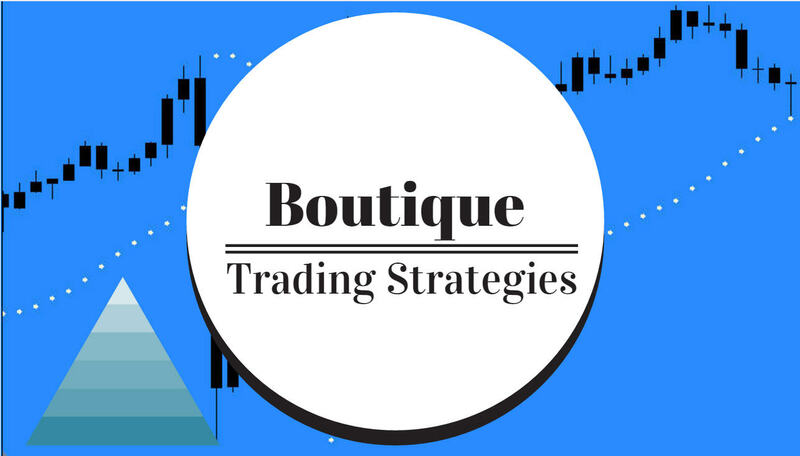 boutique trading strategies: Is Macd Worthwhile For a Strategy? Watch how I develop a trading strategy using the Macd. There are so many ways to use the Macd. 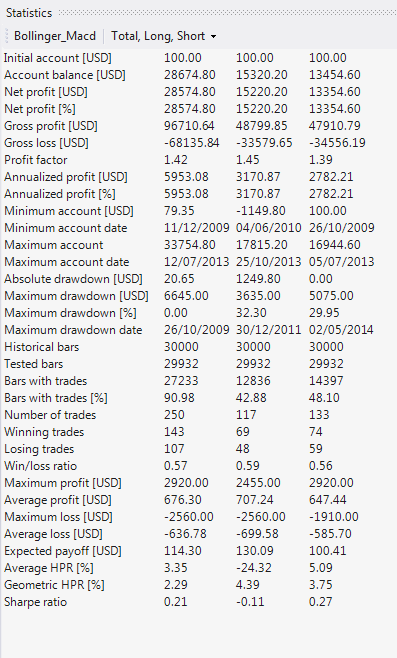 I want to develop an automated trading system which will be based on the Macd. 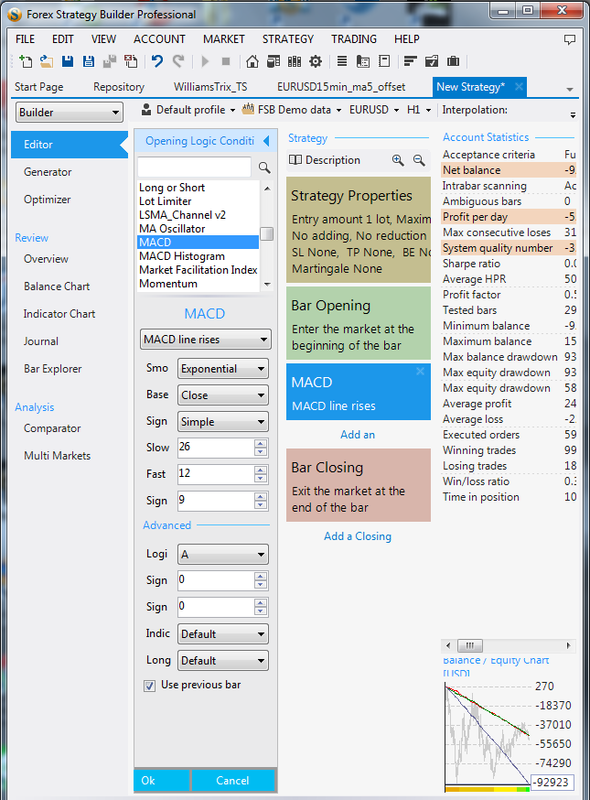 I will set up Forex Strategy Builder Pro to generate a system, using the Macd as the 'seed'. The generator in FSB Pro is free to change many aspects of the Macd as it is creating strategies with other indicators or price conditions. I am using 60 minute data of EURUSD for this purpose, 35 per cent 'out of sample' as I want to be able to see easily what I can expect from this system in future. As I have been typing this article the generator has been working, done just over 1,800 iterations which resulted in 51 potential strategies. I want to have a look at the 'Repository', there may already be a strategy of interest appearing in there. You can see that none of these look too impressive, no System Quality Number, appearing even thogh an excellent Win/Loss ratio and nice Net Balance in the selection shaded blue. I will restart the generator and set the System Quality bar to ensure that new entries to the repository have a System Quality Number. 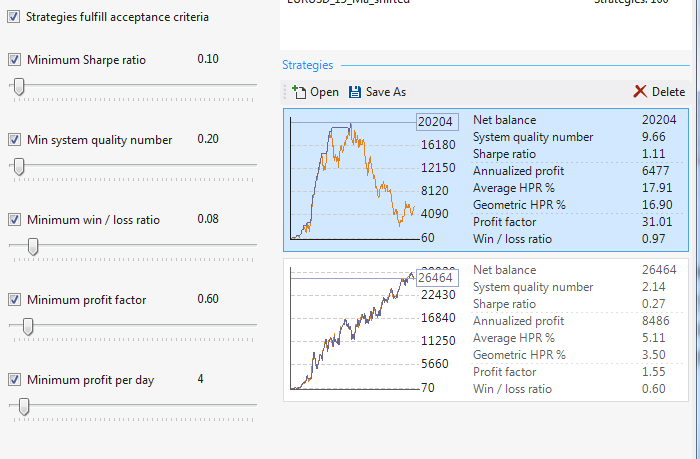 Actually I have set minimums for each criteria so that some good ones will be what appears from now on. I have set the values low so as to allow the repository to gather some results that may not be satisfactory but which may show some promising indicator combinations that can be tested on their own to see what they may produce. It should be noted that the winner of the 2006 Trading Championship used the Macd to win first place. Indeed, the Macd as a starting point for developing an automated trading strategy may turn out to be a good idea. 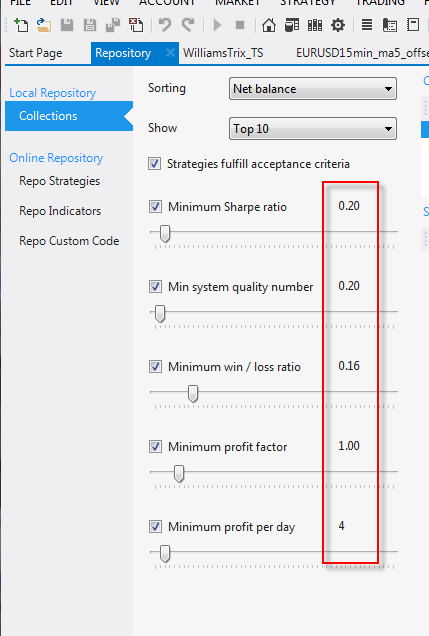 By setting some parameters for the Repository collection, I have eliminated many generated results, however, it is time to get quality instead of quantity and I will have to be patient until some good results appear. In the meantime all results are being stored in the 'Collections' so that I can peruse them when convenient. I have some results now that I will share with you, they may not be the best in terms of a system to use but they are of interest. We can have a look at these two and I will give you quite a bit of information from the program. You can see that each of these has a System Quality Number which is what I wanted to be sure to have.. The first result, the one shaded in blue is of very poor quality because there are no trades in the Out Of Sample Area. The second result has an abundance of trades and while the ratios may not be pretty there are some things to learn from examining this result more closely. I will open this result as a strategy and prepare for further examination. First we will see which indicators make up the system. .And then we have some statistics and an equity chart. You can see that the software has generated a system that takes $100 to some great sum, close to $30,000, however, this may be unsatisfactory based on the poor ratios. 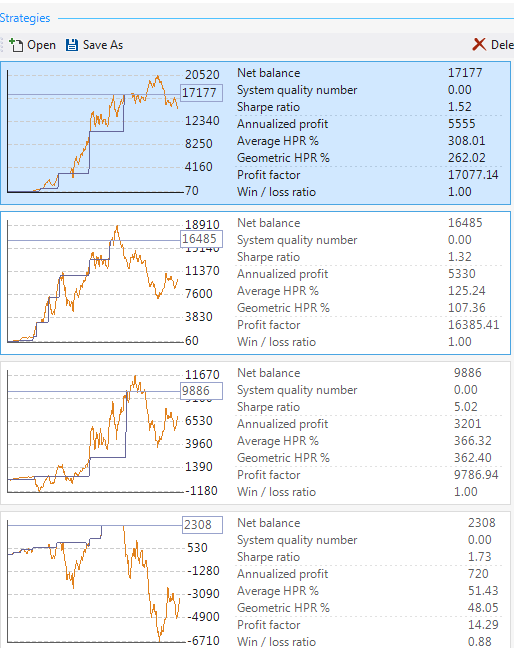 Here is an overview of that trading strategy which is quickly prepared by the software. MACD* (Simple, Close, Exponential, 47, 18, 20); MACD line falls. MACD* (Simple, Close, Exponential, 47, 18, 20); MACD line rises. Close an existing long position at the end of the week. Close an existing short position at the end of the week. No averaging is allowed. Cancel any additional orders which are in the same direction. No modification of the present position is allowed. Cancel any additional orders which are in the opposite direction. Trade percent of your account. Opening of a new position - 8% of the account equity. Trade percent of your account. 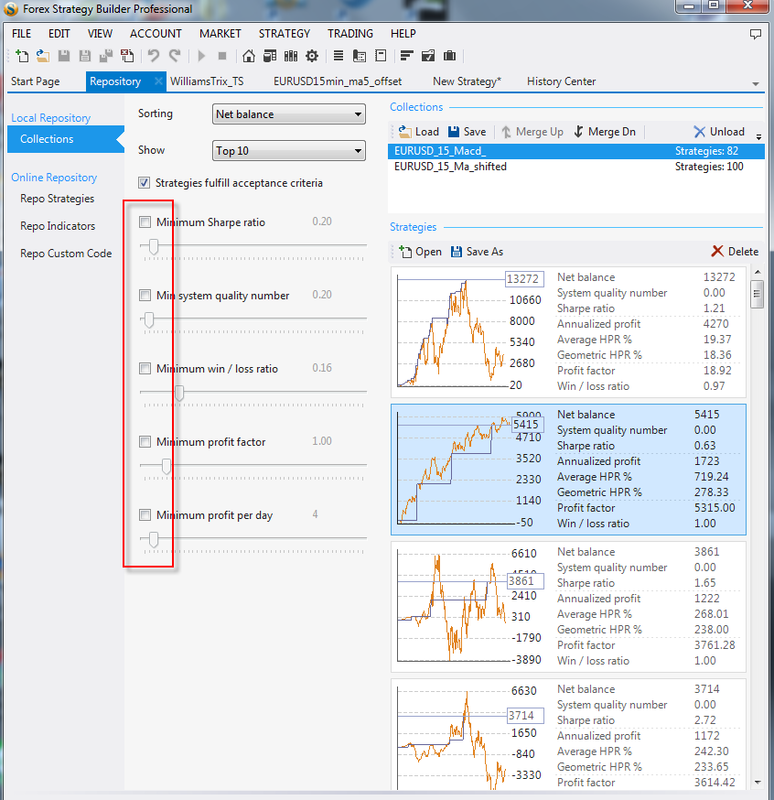 The percentage values show the part of the account equity used to cover the required margin. You can see that there are many measurements recorded for evaluation. The next step that I will do is to take this result and place it in the generator to see if there can be an improvement in the ratios. Certainly the 'Week Closing' could be improved upon, I will see what the generator can do with it. As you can see in this pic, the generator is compiling more strategies although it has not found a solution which will be acceptable so far. As time passes it will keep generating strategies and as long as I let it run it will find more and more and perhaps will develop something that I can trade with. 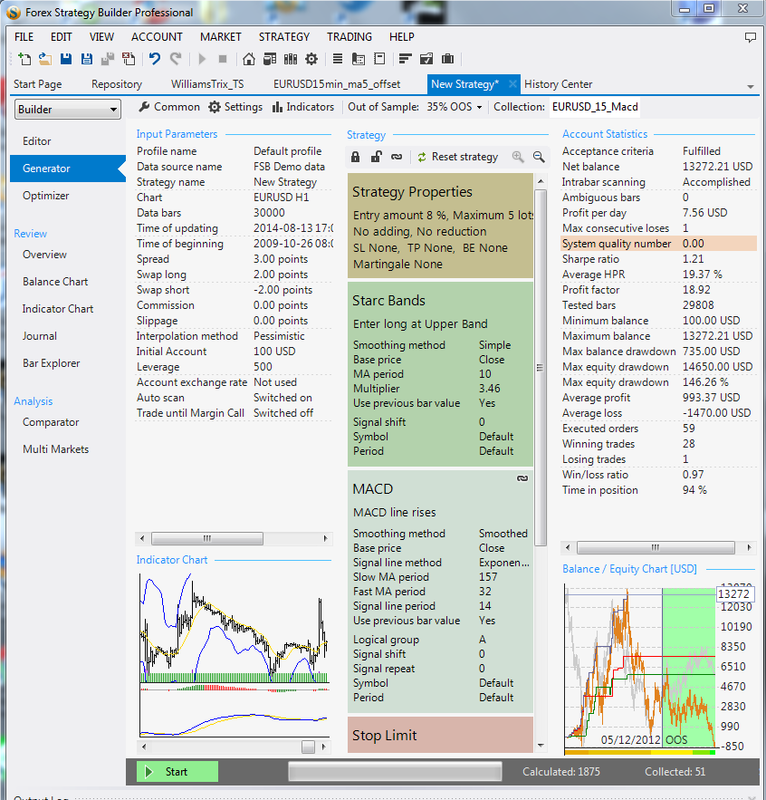 In this article I wanted to display how a strategy can be generated by FSB Pro and some of the tools in the software for evaluation. There are several more tools that I did not include in this article. The reader may want to have a look at other articles in the blog about FSB Pro, there is a lot to the program for strategy generation.